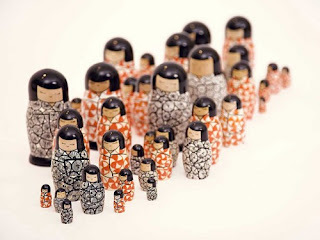 Those lovely Russian dolls belongs to Swedish Bantie..Bantie’s collection consists of sevenpatterns..In total there are 18 different colour combinations..They make cushions, floor cushions, table cloths, table mats, bags, cosmetic bags, wash bags and trays and Russian dolls.. Following is from Bantie: "Why is it, we’ve often wondered, that what’s ‘trendy’ isn’t always very personal? Why shouldn’t a genuine aesthetic not also be a little bit of fun? And why shouldn’t the contemporary cast a fond glance back towards the past? We started Bantie in 2007 as an answer to our own questions. To make what we believe in and what we like.."